In humans, cholera is among the world’s most deadly diseases, killing as many as 140,000 persons a year, according to World Health Organization statistics. But in aquatic environments far away from humans, the same bacterium attacks neighboring microbes with a toxic spear – and often steals DNA from other microorganisms to expand its own capabilities. A new study of more than 50 samples of Vibrio cholerae isolated from both patients and the environment demonstrates the diversity and resourcefulness of the organism. In the environment, the cholera bacterium is commonly found attached to chitin, a complex sugar used by aquatic creatures such as crabs and zooplankton to form protective shells. In the wild, most strains of cholera can degrade the shells for use as food, and the new study showed how the presence of chitin can signal the bacteria – which have receptors for the material – to produce behaviors very different from those seen in human disease. Among the cholera strains studied, less than a quarter were able to take up DNA from other sources. Almost all of the samples taken from the environment were able to kill other bacteria – a phenomenon called “bacterial dueling” – but just 14 percent of the bacterial pathogen strains isolated from humans had that capability. The research, supported by the National Science Foundation and the Gordon and Betty Moore Foundation, provides information that could lead to development of better therapeutic agents against the disease, which is found in densely-populated areas with limited sanitation and clean water. The research was done with assistance from the Centers for Disease Control and Prevention (CDC), and was reported online March 4 in the journal Applied and Environmental Microbiology. In humans, the cholera bacteria produce a diarrheal disease that can kill untreated patients in just a few hours. The deadly effects of the disease, however, are actually caused by a virus that infects the Vibrio cholerae strains found in humans. The toxin carried by the virus helps spread the disease among humans, but cholera strains quickly lose the virus and adapt other competitive mechanisms in the environment. 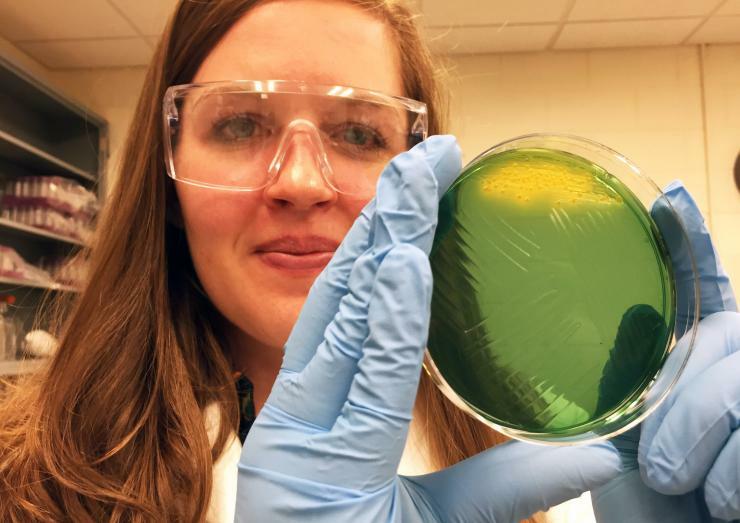 To study how cholera regulates these adaptations, Georgia Tech graduate student Eryn Bernardy obtained nearly 100 samples of cholera bacteria from a variety of sources globally, including one originally isolated from a 1910 Saudi Arabian outbreak of the disease. She then studied 53 of the samples for their ability to (1) degrade chitin, (2) take up DNA from the environment, and (3) kill other bacteria by poking them with a poisoned spear. Colonies of each strain were grown in petri plates containing chitin material. The strains able to digest the material produced a clear ring showing that they had broken down the chitin in the agar growth medium. Only three of the cholera colonies failed to degrade the chitin. To study their ability to take up DNA, bacterial cells were grown on crab shells, then exposed to raw DNA containing a gene for antibiotic resistance. 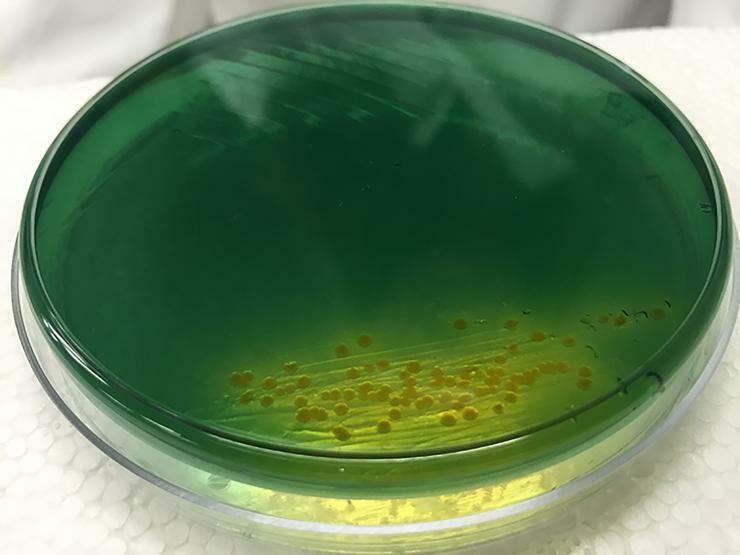 The cells were scraped off the shells and placed onto agar plates containing an antibiotic that would normally kill the bacteria. Colonies that survived showed they had taken up the genetic material. 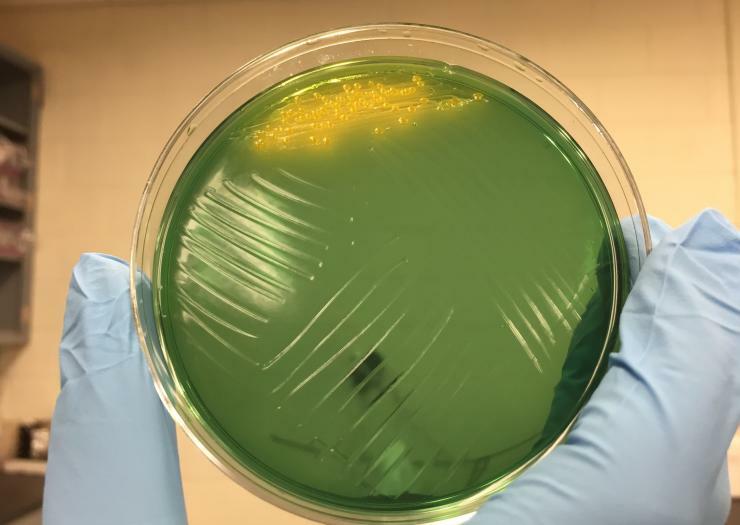 To study their ability to compete with other bacteria, each cholera strain was placed into contact with a billion or so E. coli cells on petri plates. After a few hours in contact, the researchers counted the number of E. coli remaining. Some cholera strains were able to kill nearly all of the E. coli cells, reducing their numbers to a few hundred thousand. With help from CDC scientists, the researchers correlated the behavior of each strain with their unique DNA sequences. They also examined the strains for the presence of the toxin used to cause disease. To deduce the rules governing the bacterium’s behavior, Hammer and his lab have been studying cholera for the last 15 years, starting with a single strain first isolated in Peru in the early 1990s. When a cholera outbreak began in Haiti after the 2010 earthquake, his lab worked with the CDC to isolate these new strains. In further study, Hammer was surprised to find that the 2010 Haitian strains were less capable than the 1991 Peruvian variety. Hammer compared the diversity of the cholera strains to the diversity of humans, who increasingly receive personalized health care. In addition to those already mentioned, the study included Maryann A. Turnsek and Cheryl L. Tarr from the CDC. Georgia Tech undergraduate Sarah K. Wilson from the Hammer lab, another author on the paper, is now a Ph.D. student at the University of Wisconsin-Madison. This material is based upon work supported by the Gordon and Betty Moore Foundation and National Science Foundation Grant No. 1149925. Any opinions, findings, and conclusions or recommendations expressed in this material are those of the authors and do not necessarily reflect the views of the National Science Foundation or the Moore Foundation. CITATION: Eryn E. Bernardy, et al., “Diversity of Clinical and Environmental Isolates of Vibrio cholerae in Natural Transformation and Contact-Dependent Bacterial Killing Indicative of Type VI Secretion System Activity,” (Applied and Environmental Microbiology, 2016). http://dx.doi.org/10.1128/AEM.00351-16.